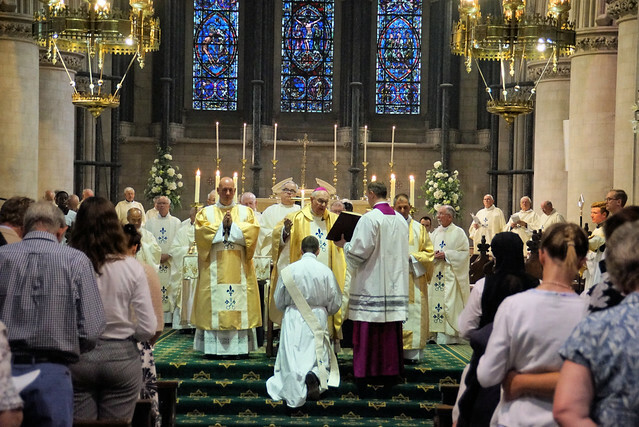 Academic and former prison chaplain, Andrew Eburne, last night (Friday July 20) became the first parishioner from St John the Baptist Cathedral in Norwich to be ordained to the Catholic priesthood in 25 years. Keith Morris reports. His ordination was celebrated by the Rt Rev Alan Hopes, Bishop of East Anglia. Andrew’s first career was in academia, teaching at Oxford University, but after a chance encounter in the Cathedral he became a prison chaplain in 2009. In 2013, Andrew returned to the academic world, becoming chaplain at the University of East Anglia. Then Bishop Alan asked for permission from Rome to ordain him and he was sent to study at Allen Hall seminary in London. “I had to learn to give up my own plans, and put myself in God’s hands. When I did that, and left everything to Him, then I found peace. Following his ordination Fr Andrew will continue to serve at the Cathedral parish, and as the Chaplain to UEA. In his homily, Bishop Alan said: “The Second Vatican Council speaks of the universal priesthood of all Christians. It is out of this priestly people of God that Jesus Christ chooses men and sets them apart to share in his High Priesthood in order that they might serve God’s people. “The call to be a priest comes from God alone. Andrew - God has called you, chosen you, for his own purposes – to be a priest in the Catholic Church and to continue the work of his Son as Teacher, Priest and Shepherd. The Rite of Ordination followed which began with Andrew prostrating himself on the ground before the altar – symbolically abandoning himself to God’s power and will. There followed the Laying on of Hands by Bishop Alan and all the priests present and the prayer of Consecration. He was then clothed in the sacred vestments of priesthood and his hands were anointed with the sacred Oil of Chrism. Finally, a paten with the Host and a chalice containing wine mixed with a drop of water were presented to Fr Andrew which were then used for the Eucharistic Prayer of the Mass which followed. Fr Andrew then con-celebrated Mass for the first time with Bishop Alan. Afterwards friends, family, university students and priests enjoyed refreshments in the Cathedral Narthex. Click here or see below for a full picture gallery of the ordination. Pictures by Keith Morris.